Atlanta truly has some cool hidden foodie gems. 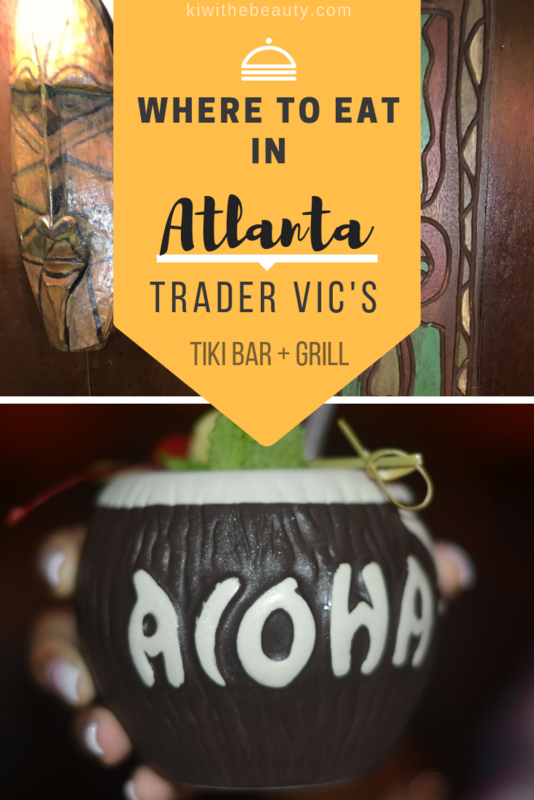 I haven’t been to a tiki spot in a long time, and if you want to experience a nice tiki bar spot in downtown Atlanta I would like to introduce you to Trader Vic’s. Tiki Bars are known for its cool exotic-themed drinking establishment that serves elaborate cocktails, especially rum-based mixed drinks such as the mai tais and zombie cocktails. 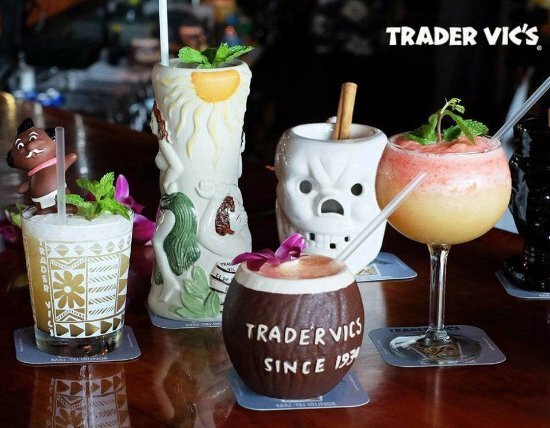 Trader Vic’s have been around since 1934. It’s restaurant has a rich history of creating a tiki bar franchised tiki chain of romanticized conception of tropical cultures inspired mostly the Polynesians. 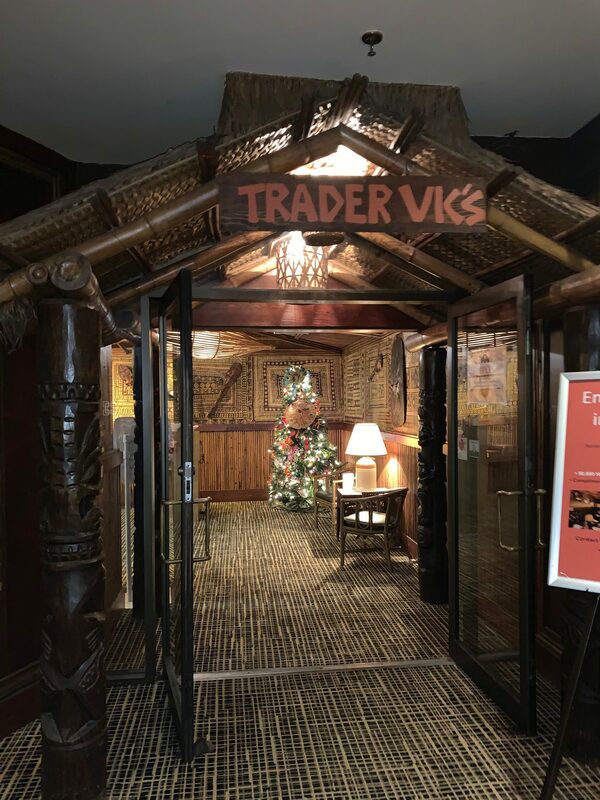 Trader Vic’s has a rich history of success and innovation that all began in 1934 when Vic “The Trader” Bergeron built a cozy little saloon on San Pablo Avenue in Oakland, California called Hinky Dinks. After embarking on an adventure to Cuba to refine his skills as a bartender and explore the subtleties of rums from around the world, The Trader transformed Hinky Dinks into a tiki-bedecked tropical retreat aptly named Trader Vic’s and put into practice his research on rums. 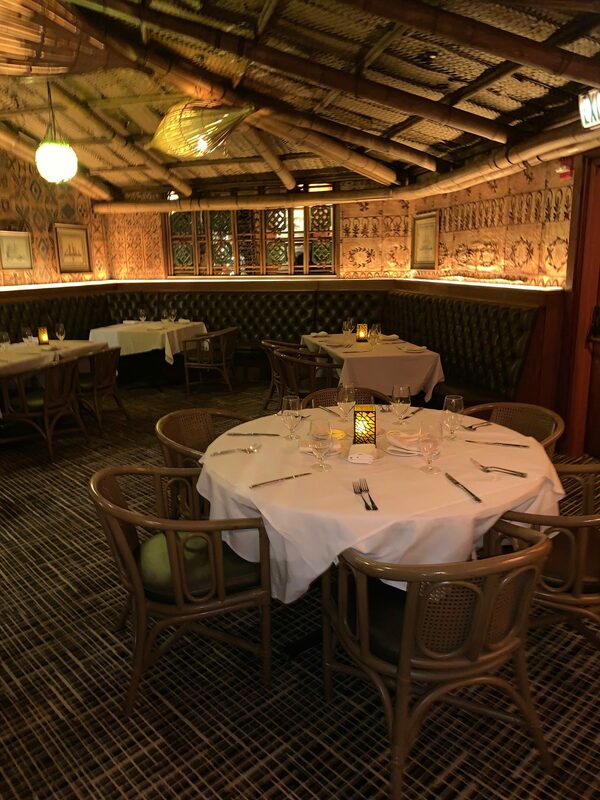 Years ahead of his time, Vic began serving simmering plates of island-style cuisine, and Trader Vic’s quickly became one of America’s first fusion restaurant concepts. 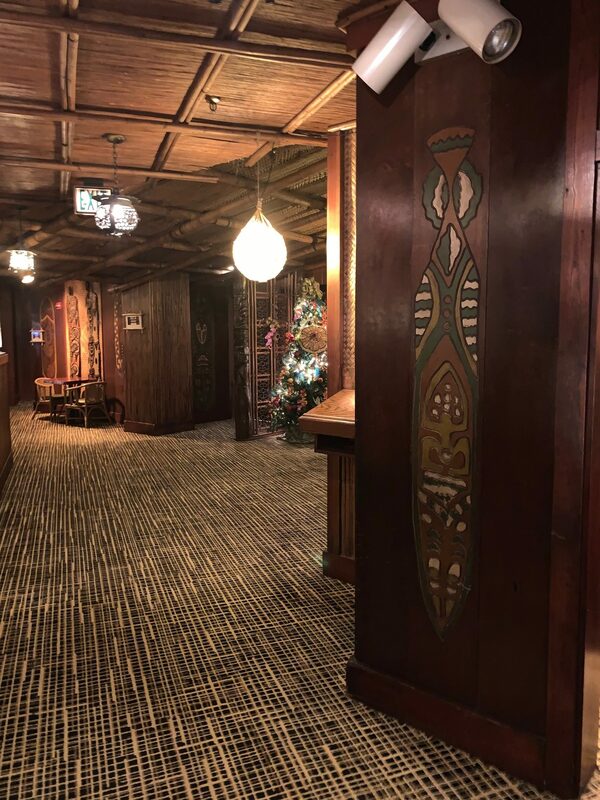 As popularity of Vic’s tiki haven grew, Trader Vic’s expanded to international shores in 1963 at London’s Hilton Hotel on Park Lane followed by a booming success in the Middle East in 1994 with multiple restaurant openings. I love the history findings of this place and its great to know they kept up with the authentic tiki set up in Atlanta. I love the decor as there are personal touches of tiki items and fixures in all of the dining areas and bars. Trader Vic’s Worldwide has a full-time team of Anthropology experts who scour the globe to collect hand-crafted and authentic pieces for each of our restaurants. 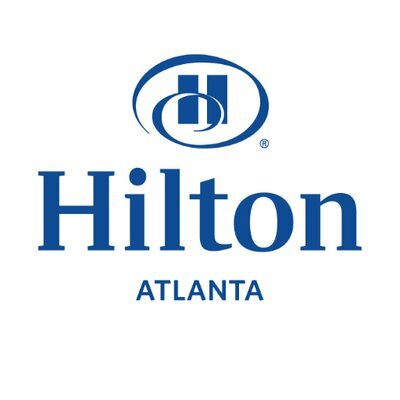 The fascinating artifacts collected from islands around the world help create a unique experience in each of our locations.Although its located the Hilton Downtown Atlanta hotel, it gives you vibes of being in a tiki hut surrounded by artificial torches. 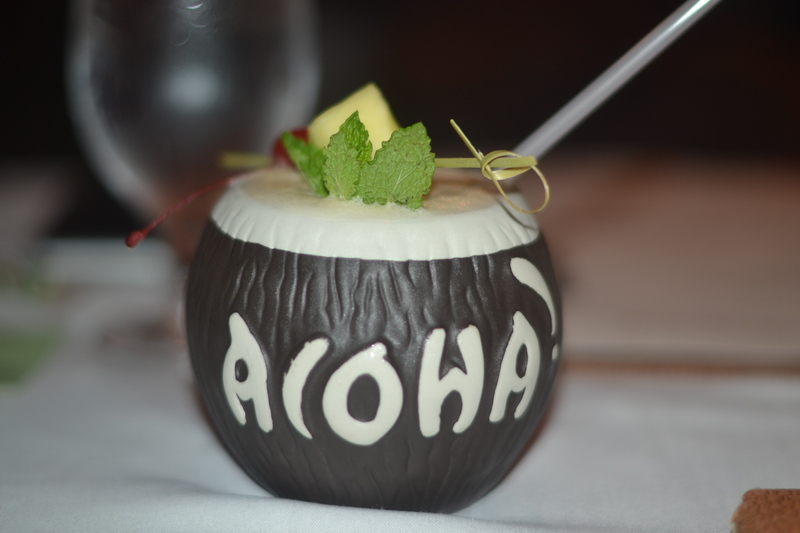 This is a drink that is actual non-alcholic but it is still served in a fun tiki cup. 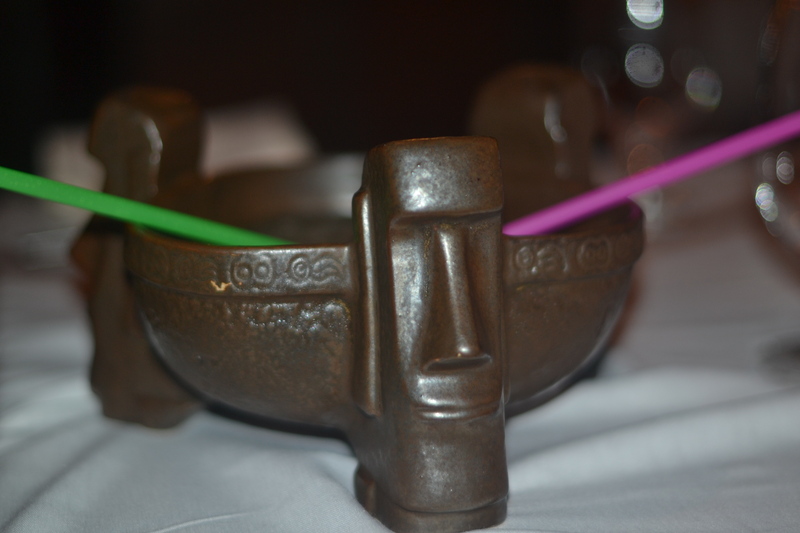 It does look like in the photo, but this tiki cup is chill and kept cold for your entire dinner experience. Love the custom cup as it keeps it festive and true to the tiki vibes. The ancient Polynesian’s ceremonial Luau drinks were serve in festive communal bowls. This Tiki Bowl is pretty massive and fun to drink out of. Definitely made for two people (or maybe 3). Please share this drink, as they give you two long straws so you can consume without having to move the bowl around the table. Fun social drink! If you like your tiki drink cup, you have the option to purchase many of the designs check them out here. I have to highly recommend this appetizer. I’ve had many crab cake patties but this is by far my favorite! The flavor combos are so rich and the veggies mix with the sauce in each bit is amazing! 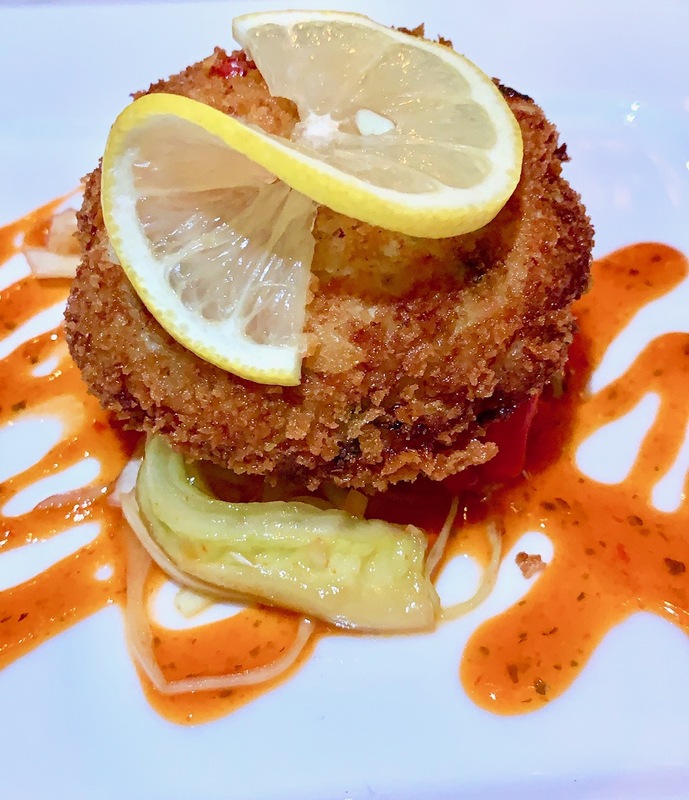 If you want the best crab cake in Atlanta, please come here and order this! I love stir fry, but I never had it with lobster. 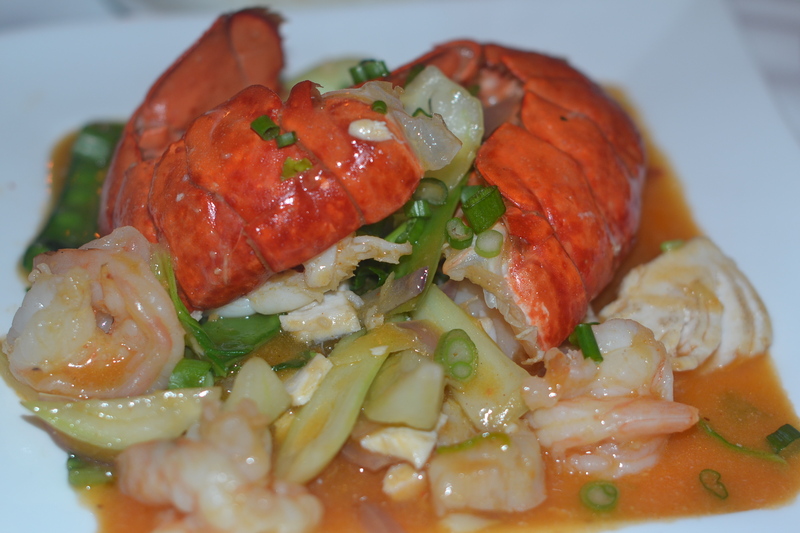 Absolutely delicious with the lobster tails and shimp cascading around this amazing dish. I would recommend this entree dish if you really love a good seafood concoction. So since this place boast of being home to The Original Mai Tai®, they have a weekly Thursday drink special here. Live Music & $6 Mai Tais every Thursday starting at 8:30 p.m. at Trader Vic’s Mai Tai Bar! 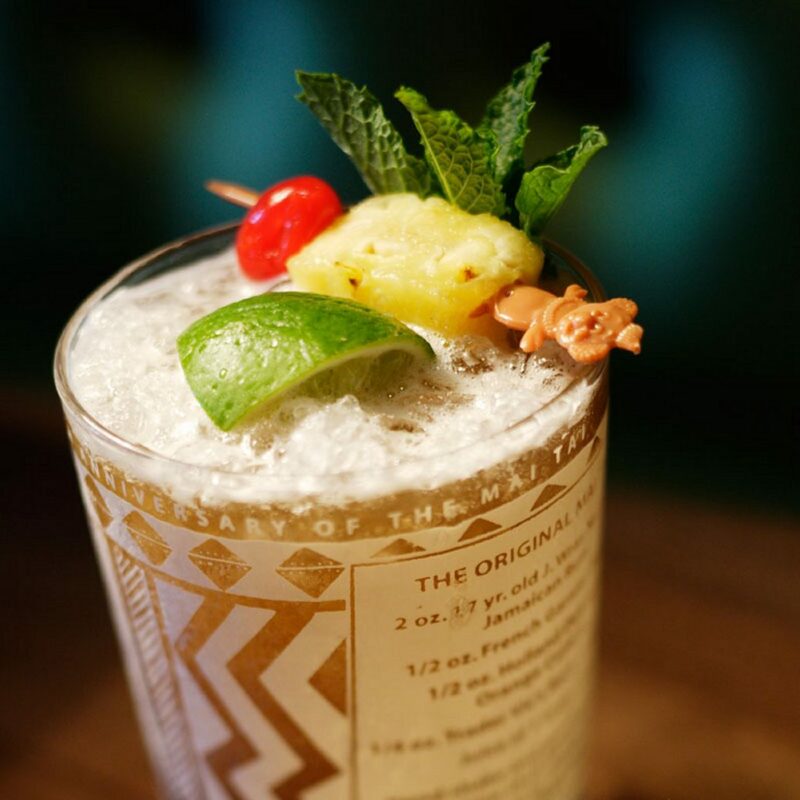 Today, the Trader Vic’s family of restaurants has locations in 17 countries across the globe. The Trader Vic’s Atlanta location is inside the bottom level of Hilton Atlanta hotel. A true hidden gem for a tiki good time. Are you a fan of tiki themed spots? I never seen Tikibar except from few movies. But it does look good,is there a beach view also like in the movies? I would love to eat Chocolate Krakatoe Cake Molten, hope there is a option for vegetarian as well. I love the decor here and the food look amazing! 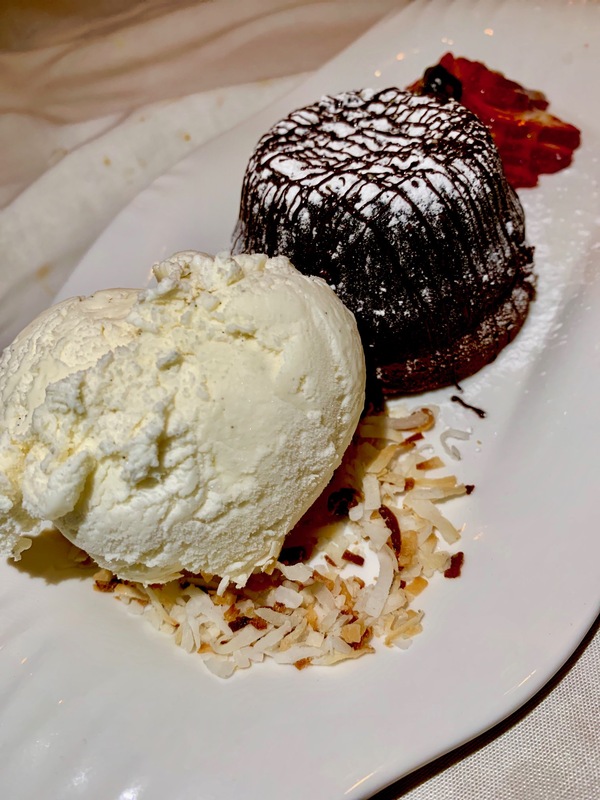 Mm, that chocolate molten cake looks amazing. The decor here is really cool also! Planning a road trip down the eastern seaboard next Summer (to look at places to potentially move to). Atlanta is on our map so this is helpful. I live in Atlanta, and I’ve never been here. I do feel like I’ve seen this place before though. The food looks amazing! How fun! I love the island vibes. The food looks good too. I’ll have to keep this in mind next time I’m traveling. This looks like a fun place to eat. The food looks really tasty and I feel like I need that dessert in my life. That tiki bar looks amazing and the food omg, i am drooling for real! I am planning a visit to Atlanta in Feb, will definitely check the place, thank you so much! Love the tiki bowls! You could collect quite a fun collection with those! Wow, what a cool Tiki Bar! I would have never found something like this on my own! Thanks for your recommendations! I love the fun drink cups. The food sounds so amazing and so does the coconut drink. That looks like such a fab venue for a bite to eat and a few drinks. 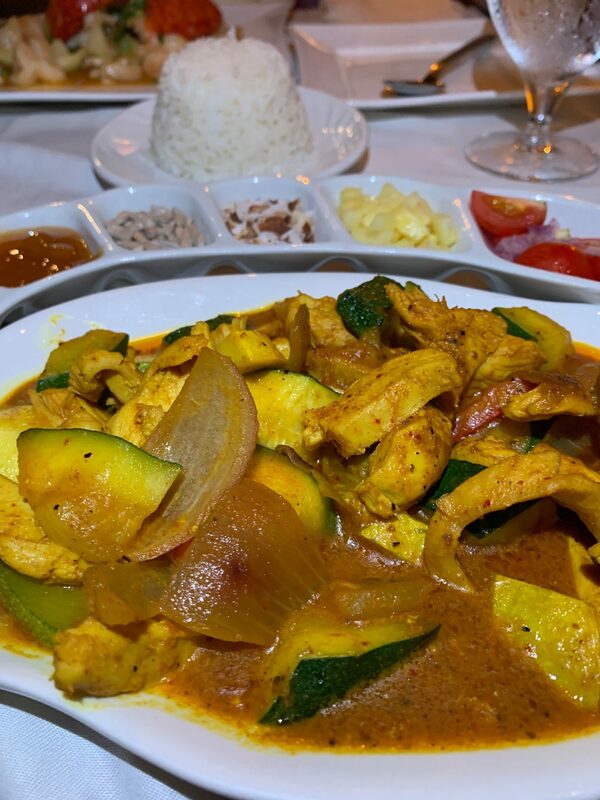 The food looks absolutely delicious, especially that massaman curry. What great themeing! My husband has been after me to take a trip to Atlanta and we’ll have to add this to our must-visit list! Love the idea of a weekly drink special! Definitely want to check them out. This looks like such a fun place to eat in Atlanta! I love the decor and the drinks look so amazing! Looks like a really fun place to eat at! I love the theme…how fabulous! I am loving this tiki bar. I love the decor and the food look so tasty. I love the unique theme! and the food looks amazing! I am a sucker for the details and they nailed them all. They give you an authentic experience. Everything looks delicious, I’m a sucker for a great crab cake. I love how the tables don’t seem crammed in there! The chocolate cake looks super tasty! Oh I love your pictures, the food sounds amazing!! I would love to visit Atlanta one day!! Looks like a great place to visit for some good island dishes! I have never been to atlanta but now that i have read your post, it is defo in my travel bucket list as the food looks amazing! I don’t know when we will visit Atlanta, but if we ever do, I’ll be sure that we try this out. It got me with it’s island theme type restaurant and both food and drinks looks yummy to try. 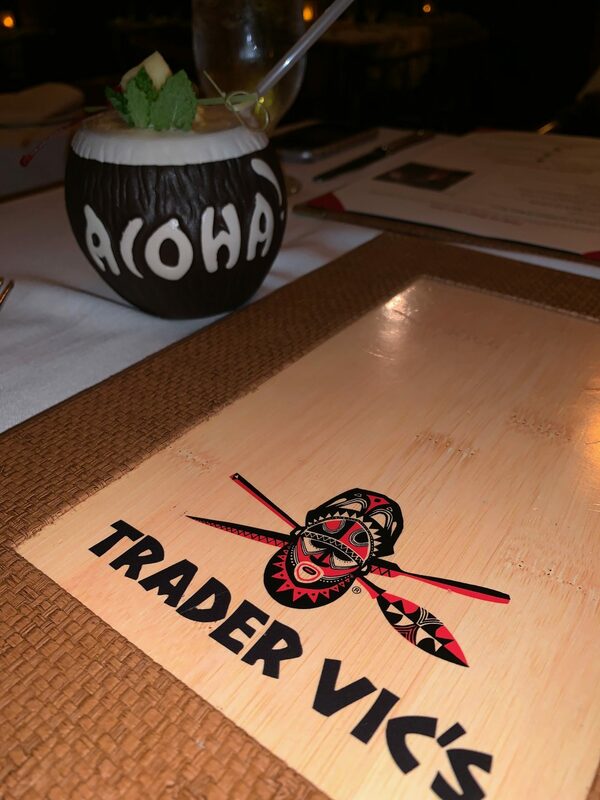 Trader Vic’s seems like a cool place to visit…would love to try the crab cakes. I travel to ATL pretty frequently from Birmingham, AL and am always confused about what restaurant to try because they have so many. I love the culture of this place and will definitely be trying this out in the near future. I love this place, everything about it screams fun and adventurous. From the food and the atmosphere, I want to try this experience! looks incredible, your photos are fab! Atlanta isn’t too far from me, and my husband and I have been wanting to go for a long weekend. I love knowing where to eat in Atlanta so when we go we will know exactly where to head to first! how interesting is this venue! the décor is quite unique and looks fun as well! and the food! there is no doubt that it is as tasty as the photo! now im hungry! It looks like a really nice spot for the night out. I am not into alcoholic drinks but the food does look amazing and tasty. Now this seems like a really interesting place to go and get something to eat and drink. I absolutely love how they have done the place up it is beautiful. all these places look so cool! now I want to go ! I definitely want to go! This place looks like a great time and the food looks amazing. I think we need to plan a trip to Atlanta. This looks like a fun place! We have a place that is similar locally and we loved it! How fun! Reminds me of a tropical island with the cups. Wow, I never heard of this before and seems like an interesting place to try out. The foods looks so deliciously made. Will take note of this so we can consider this when we went to nearby areas. Wow! These are awesome places and super delish dishes. I just love the ambiance. Perfect for family and different types of celebrations. I love the whole Polynesian interior of this restaurant. The ambiance adds good food experience to every diners! Tiki bars have the power to transport me to exotic places without leaving the city! Great review!